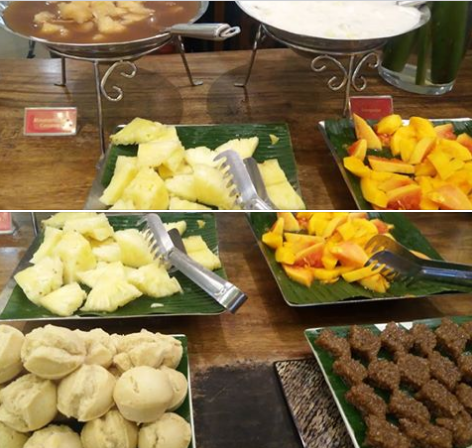 Luckyfinds: Satisfying Buffet at Cabalen plus a Giveaway! Satisfying Buffet at Cabalen plus a Giveaway! Many people patronize buffet-style restaurants because these dinners allow them to taste a wide variety of dishes. 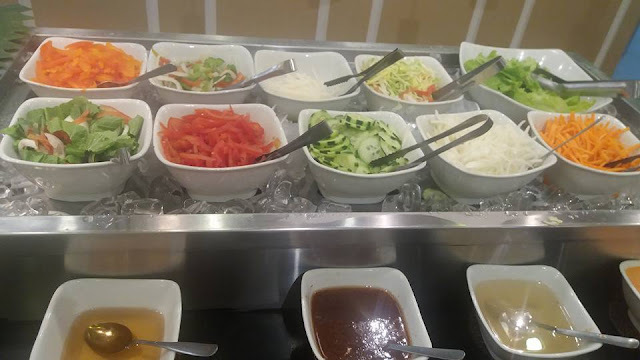 I love going to buffets as I get to have more of my food favorites and get to discover new ones at a very affordable price. I usually go to Cabalen to satisfy my cravings for Filipino food. 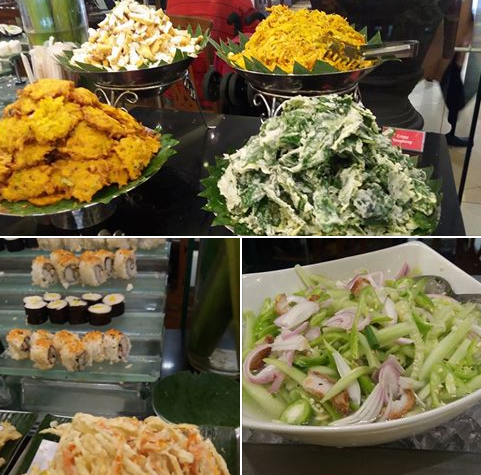 Cabalen's eat-all-you-can buffet is priced at P 298 per head on regular days ; P499 per head on weekend lunch. 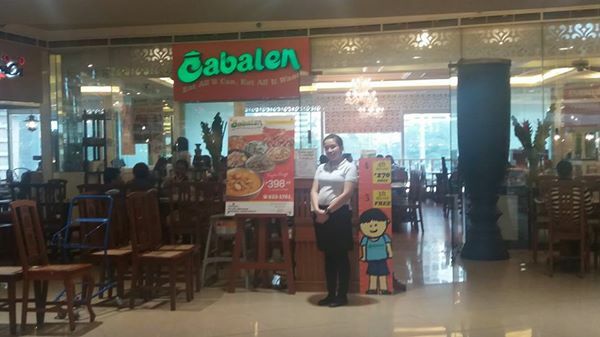 Cabalen buffet has expanded to include Japanese and Chinese food in Cabalen’s Mall of Asia, Megamall, and Ermita branches (P 398). I went to SM Megamall branch this time for their Filipino-Asian Buffet. The place was jampacked with people. Their salad station shines the spotlight on garden-fresh veggies, Chopped tomatoes, cucumbers, lettuce, carrots, watercress, onions, and parsley combine with your choice of drizzled dressings. They even had different salad concoctions and offer a selection of vegetable tempura! The crispy kang-kong and okoy is a must try, I like the tartar dip that goes with it. 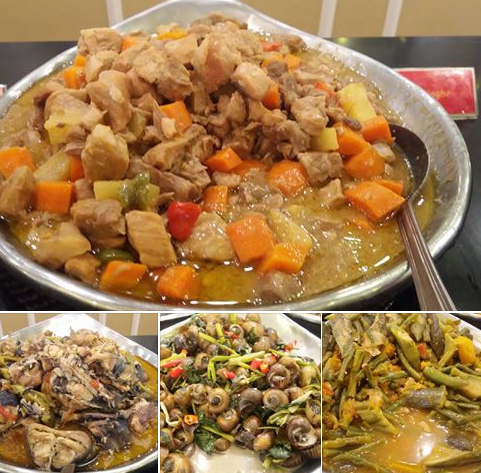 They also have great Filipino viand to choose from like Kare-Kare (tripe cooked in peanut sauce), Lechon (roasted pork), Pinakbet (sauteed mixed vegetables), Beringhe (Pampanga's version of paella), Ginataang Kuhol (golden apple snails are cooked in coconut milk), Sisig, Dinuguan (pork stew) and other Filipino trademark foods. They have Tofu, Pork, Chicken and Bangus Sisig which they serve in small iron skillets upon order. I had several servings of my favorite Kare-Kare. Cabalen makes it from scratch and I love how tender the tripe stew is! It goes well with their in-house bagoong, which has the right mix of saltiness and sweetness. 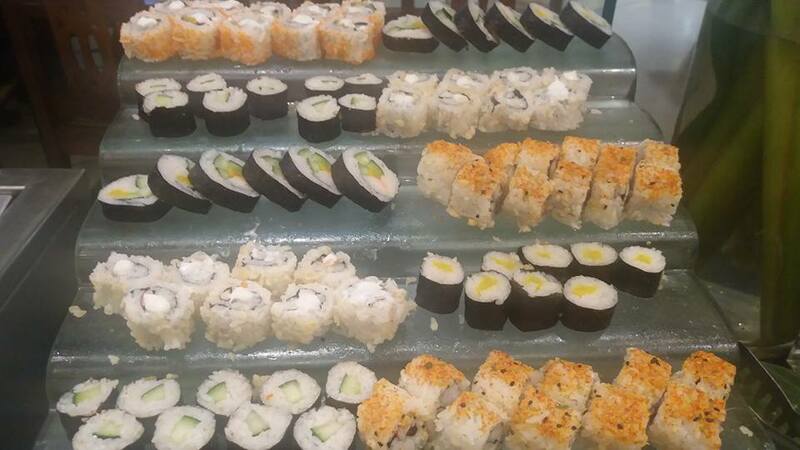 Filipino-Asian Buffet includes Maki sushi, vegetable rolls and california rolls. Chinese favorites, including siomai and steamed rice! I also took fancy on their Lechon Kawali. The crispy pork cutlets that are tender and moist. Biting into these meat cracklings was heavenly! They also have a handful of grilled fishes and the real Kapampangan burong hipon (shrimp with fermented rice) or burong aligue (crab fat with fermented rice) that gives texture to these dishes. A couple of steamed vegetables like eggplant, ampalaya, okra etc. completes the experience. 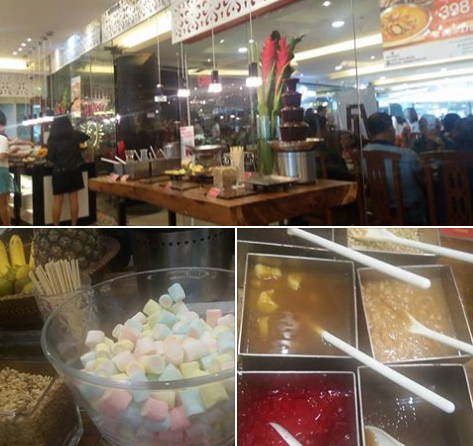 They have chocolate fondue, fruits, puto and kakanin for your sweet cravings. If you like Halo-Halo, youshould try out their Guinumis selection, Guinumis is a Filipino dessert similar to Halo-Halo. It is a beverage mix made from coconut milk, toasted pinipig, sago and gulaman. 1. Like and tag Lucky Finds Facebook Page. 2. 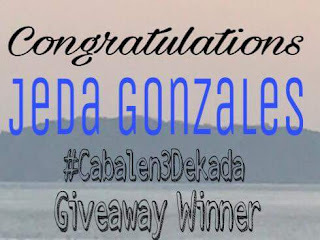 Like and tag Cabalen's Facebook Page. 3. Follow Cabalen's Instagram account. 5. 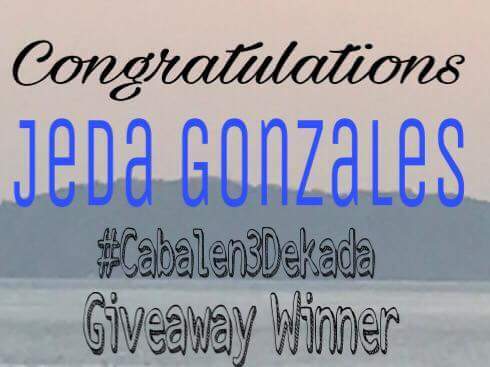 Share this blog giveaway on Facebook using the hashtag #Cabalen3Dekada. 6. Post your link, email and username (Facebook and Instagram) in the comment section below. The winner must claim their prizes at their head office located at #54 JP Rizal St. corner Aguado St., Project 4, Quezon City (near Katipunan LRT Station). Cabalen is a really affordable option for buffet meals. They have a lot of dishes to choose from. I'm glad that they are adding more dishes on their offerings. Para naman makasabay sa ibang buffet restaurant. We are not really buffet people, but I would not mind winning a buffet meal here at Cabalen. I have tried their buffet before and the food is very good there. I like the meals at Cabalen as it's not too overwhelming in terms of number of food. It does include all the great choices. If I'm in the mood for Filipino food, I go to Cabalen too. I'm lucky that there's one near my office because their lunch buffet's super sulit. Availed of their buffet made of Filipino dishes and it was good. Food selections were truly Cabalen. I personally like their fresh seagrass salad and their native desserts. Lovely place! I love salad stations. Being a vegetarian, I can at least gorge on them if no other food is available. Good luck to giveaway participants. woo... nice international buffet! I hope they are open to hosting foreign blogger when we come to visit? I really hope to try the authentic local dishes! I wish I can say I love Cabalen but I wasn't very happy when I ate there once with my hubby and son. It was lunch time and there didn't seem to be too many good options to choose from. Hindi ko nakita ang Japanese, honestly. Puro Filipino food and desserts lang. Maybe I missed it? Cabalen’s Mall of Asia, Megamall, and Ermita brances do have the Japanese food options.